Joel and Ethan Coen’s Oscar-winning No Country for Old Men (2007) is an Existentialist film noir based on Cormac McCarthy’s novel of the same name. The film is notable for several reasons, not least of which is the extraordinary degree to which the Coen brothers have faithfully transcribed McCarthy’s novel to the screen. As a consequence, the authorship of this film narrative must be almost entirely credited to McCarthy, with the Coen brothers being credited with having the intelligence and commitment to stick with the story exactly as McCarthy told it and the skill to craft it into a film. This is not a trivial point. Attempts to transfer novels directly into screen visualisation usually fail, and for several reasons. Whereas films are essentially dream-like and action-oriented, novels are really extended essays in narrative form. In addition, interior monologues and narrative commentary concerning abstract subjects are not easily and compactly represented in film form. There are also usually far too many events in a novel to be depicted in a two-hour film, and for this reason short stories and novellas are often more suitable sources for film scripting. As a consequence, it is almost always necessary to pick out the more action-oriented elements of a novel and carry out other plot modifications in order to have the story told in about 100 minutes. 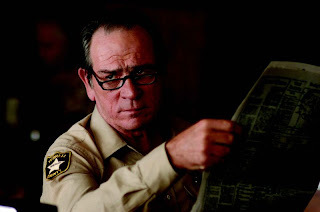 Furthermore in the case of McCarthy’s No Country for Old Men, there are actually two stories: an action-packed inner story about stolen money, and a slow, reflective, downbeat outer story about a sheriff who witnesses the goings on. It is to the Coens’ credit that they stuck with McCarthy and told both the inner and outer stories, rather than simply presenting the melodramatic inner story. That’s what elevates the film several notches above the level of a grisly crime flick. Llewellyn Moss, a young cowboy who lives in a trailer with his wife and hunts antelope out in the west Texas open spaces when he is in between jobs as a welder. The other part of the film, the outer story, concerns Sheriff Ed Tom Bell, who soon learns that Moss has the stolen cash and that Chigurh is on his trail. Bell’s goal is to find both of theses men – to protect Moss from destruction and to arrest Chigurh before he kills Moss. Along the way, the elderly lawman, from a family history of lawmen, reflects on the demise of the social order that has occurred since his youth. He occasionally discusses the degenerating state of society with other aging lawmen, who are equally gloomy and powerless to stem the seemingly inexorable decline of common decency and morality. This is the moody, elegiacal strain to the story that pervades most of McCarthy’s novels and is, to a certain extent, captured in the film. What captivates most audiences, of both the novel and the film, is the character of Chigurh. He is not simply a psychopathic killer, but is more of a symbol of the unquenchable and relentlessly destructive power of karma. He is ordinary, but at the same time he is also inordinately repulsive and strange. He conjures up some dark, half-forgotten personage in everyone’s nightmares. He is Death. He is Kali. At least, a psychopathic killer can be potentially localised, isolated, and ultimately destroyed -- but not, it seems, Chigurh. He represents the brute, uncaring swirl of dark forces which play out their machinations according to unfathomable and unalterable rules. As a fictional character, he is reminiscent of McCarthy’s "Judge" in Blood Meridian, but Chigurh is perhaps an even further advance in the direction of the apocalyptic. Sheriff Bell senses the utter depravity of Chigurh and sees him as representative of a new, soulless breed, driven by drugs and money, that is here to stay. Bell is powerle ss to turn the tide and can only make melancholic comparisons between the comprehensible past and the incomprehensible present. For McCarthy, it seems, the few decades following World War II, where some general degree of order and human decency prevailed, even among the lawless, may have been an exception in human history. That all-too-brief period may have been a unique and isolated period that is now fading away forever. Those who lived through it were living in a cacoon that could not endure. These reflections of Bell (and McCarthy) are the core of the outer story, and although the film spends less time than the novel on this aspect, the basic themes are there. The significance of the outer story is emphasised when the inner story ends abruptly and disturbingly, without the closure that most audiences expect. The outer story offers the final commentary. Fans focusing strictly on the inner story feel cheated. One might speculate further about McCarthy’s ultimate vision. 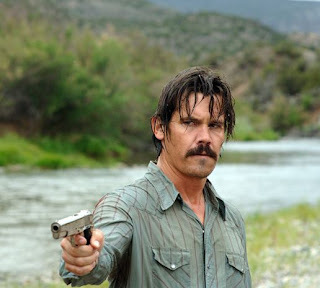 In an early scene, Llewellyn Moss spies an antelope through his gun site and whispers, “hold still”, before he shoots to kill. Later, Chigurh approaches a motorist that he has forced to stop on the roadside and says softly, “hold still”, before exterminating his victim with a cattle stun gun. The stun gun is an efficient way to kill pastoral animals: a cylindrical bolt is explosively shot forward into the animal’s brain and then retracted, killing the animal instantly. This is the mechanised way of killing animals (10 billion per year in the US alone) which is now customary. The animal about to be killed is not approached in hostility, it is merely terminated by a soulless executioner who operates according to rules incomprehensible to the animal. To the many humans killed by Chigurh in this story, their own deaths are equally inexplicable. To Chigurh it is natural; it is their karmic fate. This is the way the world works. Bell finds the modern world incomprehensible, but we can see the connection between Moss and Chigurh. Our killing of animals for meat, which is harmful for human health, unsustainable for the environment, and ultimately inhuman, is reflected in the persona of Chigurh. Whether McCarthy intended this connection or not, it would be worthwhile reflecting on it. The filming of No Country for Old Men is skilful and effective throughout. If there is one thing that characterises the Coen brothers’ films, it is the depiction of a more-or-less ordinary character situated in a world that is spinning out of control. It is not just individual adversaries that the character must deal with, it is the entire world that seems unmanageable. This is a cinematic disposition that they share with Hitchcock, and McCarthy’s novel works perfectly for them in this film. However, the Coen brothers sometimes employ effects that unfortunately distance the viewer from the fabula, and this reduces one’s involvement. By sticking closely to McCarthy’s narrative almost every step of the way, they have avoided that tendency, much to their and our benefit. Also, the Texas landscape once again serves them well: my favourite Coen brothers film was their first, Blood Simple (1985), which was also set in Texas, and there are significant affinities between No Country for Old Men and that film. This brings me to a minor point that has been the subject of some discussion. When Bell visits the crime scene at night at the El Paso motel after Chigurh has killed Moss, there is a brief, but very obscure, image of Chigurh in the darkness. But where exactly is Chigurh? Many people, including the IMDB FAQ, argue that Chigurh is hiding somewhere in the hotel room. I don't think so. In McCarthy’s novel at this point, Chigurh is outside in the darkness, sitting in a truck in the motel parking lot. Chigurh presumably sees Bell from there, but does nothing, since Bell apparently doesn’t see him. This strikes me as more plausible location of Chigurh, and I believe that the film follows the book here. The very fact that Chigurh's location is a confusion to so many viewers is an indication that this shot was not well executed. A much better shot in this same scene is the point-of-view shot of Bell glancing at the unscrewed front panel of the motel room ventillation duct. In that brief shot we come to know what Bell doesn't: how Chigurh recovered the money. The casting of the roles and the performances are spot on. 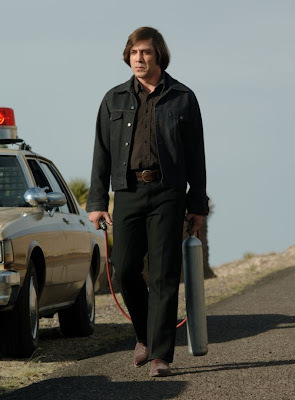 Javier Bardem has the moves and the demeanor appropriate for Chigurh. And all the actors match up well with the characters in the novel. Woody Harrelson is just right as the mafia hitman, Carson Wells. And a movie like this just wouldn’t be right if it didn’t have Barry Corbin in there somewhere, and, sure enough, he has a small, but significant, presence. As a novel, No Country for Old Men is not my favourite work of Cormac McCarthy. I find The Border Trilogy -- All the Pretty Horses (1992), The Crossing (1994), and Cities of the Plain (1998) -- to be superior and more haunting narratives, in particular, All the Pretty Horses. Many people prefer McCarthy’s Blood Meridian, which is as dark and dystopic as you can get, and although that might appeal to some tastes, I find it somewhat artificial and schematic. But No Country for Old Men is certainly good enough, and it has been meticulously brought to the screen. A film version of Blood Meridian is said to be coming out in 2009, but I doubt it will top the Coen brothers’ offering. fandango - This movie sucked. The book was so much better its not even funny. They totally screwed it up, they left out several key things and wound up making a terrible movie. It's an insult to Cormac McCarthy and an insult to anyone who has read the book. it's nonsense and I am furious with the Coen brothers. I've liked their movies for a very long time but this, they totally blew it and I can't believe they did because it's such a good story. The stuff they left out would have wound up making the movie about 20 minutes longer, god forbid anythings longer than 2 hours though. Absolutely pitiful. To someone who hasn't read the book the movie might seem OK, but if you've read it like I did and then see it you should be appalled with the omissions that they chose to make. I understand that they always change things a little going from books to movies but c'mon, what they did is just down right awful.